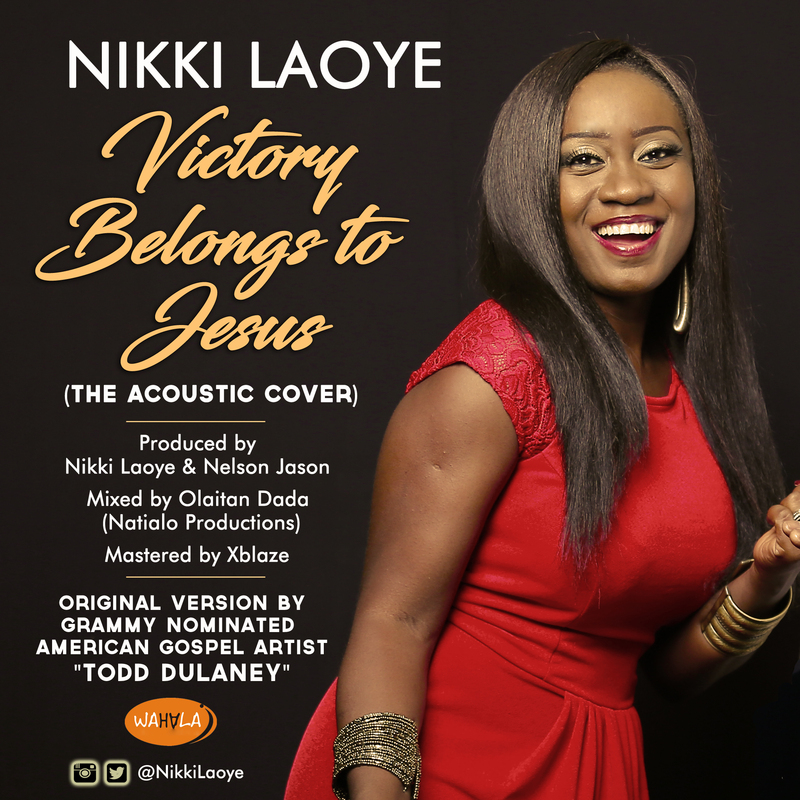 Multiple Award winning Singer, Nikki Laoye has just released a soulful acoustic version of the popular worship song, “Victory Belongs to Jesus” as she celebrates her 11th year in the Music Industry. The song was originally performed by Grammy Nominated American singer, Todd Dulaney whom Nikki had earlier met and interviewed for her radio show, Girls Rock With Nikki Laoye, while she was on tour earlier this year in the United States of America. “Everyone knows that I have a special soft spot for this song. It totally encapsulates all that God has done for me and my family over the past 11 years – a reminder that through the Good, The Bad and even The Ugly, I still had the Victory through Christ Jesus as All things were working out for my Good. Ever since the first day I heard it, the song spoke my heart and with the help of my friend/rhythm guitarist, Nelson, I produced and recorded my version of the song in March 2017 before I travelled on tour to the States but wasn’t ready to release it at the time. I didn’t even know that I would be meeting the man behind the song on that trip but God, who knew what the song meant to me, orchestrated it all and I got to tell Todd Dulaney about the cover and the impact of his music on my life. The Song says it all for me – It’s definitely been 11 Years of God’s goodness, favor and mercy through the highs and lows since I began my solo music career in 2006. 11 Years and I’m still Standing!! Yes.. It’s been 11 VICTORIOUS YEARS with Jesus right by my side.. Yes, the #VictoryBelongsToJesus & I am grateful that He called me & made me a blessing – A VOICE OF LOVE & HOPE IN THIS GENERATION. God bless My Management (Wahala Media Ent), My Producers, My Team, The Media, My Pastors, My Friends, My Family…Everyone who has stood by me from Day One. Now I am gearing up to do more. I haven’t even started…. Here’s to a New Beginning..
Nikki Laoye was introduced to the Nigerian Music Industry in 2006 by her long standing management company, Wahala Media Entertainment, with her debut rock single, “Never Felt This Way Before”. The Award winning singer is renowned to have pushed the bar, taking Gospel Music over the walls of the Church and creating a wider acceptance of Urban Gospel/Inspirational Music in the Nigerian Music Industry with numerous mainstream awards including The Headies, AFRIMA (All Africa Music Awards), NMVA (Nigerian Music Video Awards) etc. An Advocate for the Physically Challenged, the Displaced and Refugees, She has also been celebrated with awards and recognition by the Federal Government, Nigerian & International bodies as a Humanitarian personality of repute via the services of her Angel 4 Life Foundation. Congratulations Nikki Laoye, we celebrate with you and together we do say that “THE VICTORY BELONGS TO JESUS” .